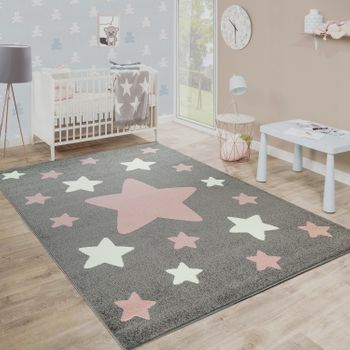 Take the stars out of the sky for your little treasure with this magical play rug. The cool star motif in blue and grey will dial up the style in any childrens bedroom, and serve as an irresistible invitation to cuddle and play for girls and boys alike. This heavenly frisé rug with a child-friendly design is exquisitely soft and comfortable. The tasteful pastel colours coordinate flawlessly with wooden furniture. 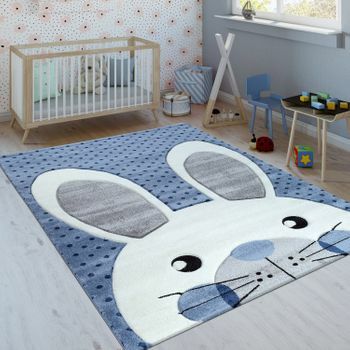 Children are more susceptible to harm than adults, which is why this childrens rug has been tested for hazardous substances on the basis of Oeko-Tex Standard 100 criteria  a test it passed with flying colours. This low-maintenance and dirt-resistant short-pile rug is made from 100% polypropylene, and is suitable for use in rooms with underfloor heating. It has a pile height of 9 millimetres and a weight of 2,300 grams per square metre. 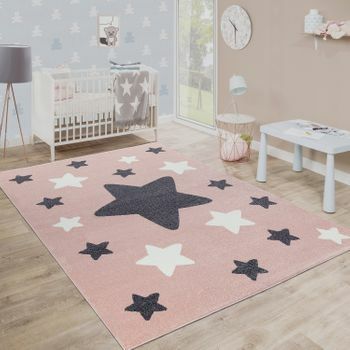 Our tip: Stars exude peace and a feeling of security, making them a long-beloved motif in the bedrooms of children young and old. If your child is fascinated by the starry heavens, why not conjure up a twinkling sky in his or her own room using glow-in-the-dark constellations? They charge up with light during the day when the sun is shining, and then glow at night.